Step by step instructions on how to make a Mason Jar Potpourri Warmer. This is a wonderful, home made gift idea for any season! 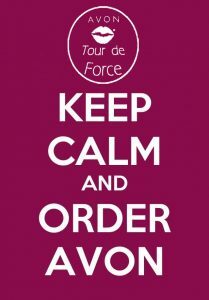 Are you looking for an inexpensive Christmas gift? Simply use a piece of Holiday, pine cone or winter scene printed fabric for the cover, colorful ribbons and add cinnamon or pine scented potpourri to the jar. 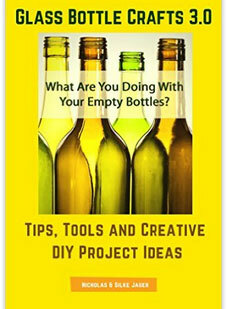 Use the diamond tipped drill bit to make a hole in the back of the Mason Jar. Take a look at our instructional videos if you need help drilling into glass. Add potpourri from the top of the jar. It’s best to do this in succession, add a few lights then add some potpourri, more lights, more potpourri until the jar is filled. Cut a piece of cloth to cover the mouth of the jar, approx. 5 inches in diameter. Any cotton fabric will do just fine. Make sure to cut it large enough so the cloth can hang over the sides. Cover the rubber band with a piece of rope, colorful raffia or a decorative ribbon. Plug in your Mason Jar Potpourri Warmer and enjoy as the scent of warming potpourri fills your home. As the scent fades over time, simply remove the cloth and add fresh potpourri or dribble a few drops of fragrance oil or essential oils on the cloth. Lighted potpourri jars are such an easy craft that they make ideal hostess gifts for impromptu holiday gatherings. Giving a Holiday Potpourri Mason Jar as a gift? Add a few festive ornaments or other seasonal decorations, wrap in cellophane and tie with curly ribbons. Add your unique touch to make illuminated potpourri holiday jars for gift giving or holiday decorating. Mason Jar Potpourri Warmers make it easy to infuse a room with holiday ambiance! 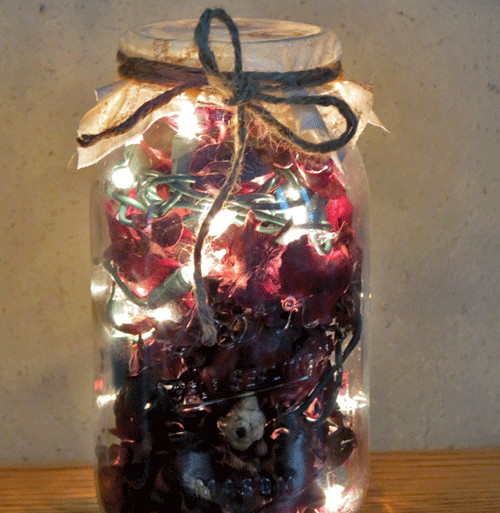 Get inspired with more Homemade Potpourri Jars with Lights! Do you have questions or suggestions? Please leave us a comment below. 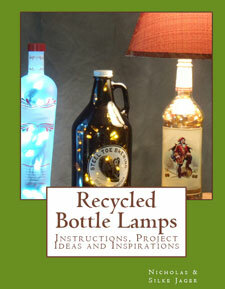 This is a great gift for friends durning the holiday season. I would like more ideas and instructions on how to put them together. Thank you. Hi Janet, I’m glad you like our Mason Jar Potpourri Warmer and yes, it is a wonderful gift idea that is very easy to make. 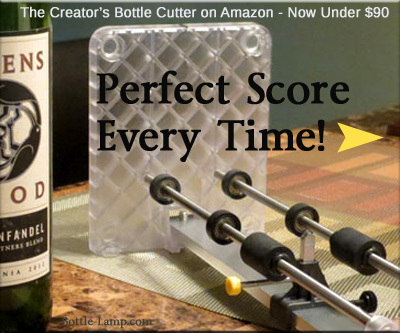 To learn how to drill a whole in the glass jar you can watch out step by step video tutorial on the Bottle-Lamp home page. Once the hole is made you simple insert the light string through it and add the potpourri and any decorate fabrics, ribbons, or ornaments you choose. You can then wrap the jar in cellophane, craft paper or gift wrap, tie with curly ribbons and don’t forget to attach a gift tag. Hi! Approximately how much potpourri per jar do you end up using? 1 cup? cup and a half? Our American Heritage Girls troop may end up making and selling these for an upcoming craft fair, and just getting info together. Thanks! I would not recommend Viagra because it is expensive and can cause side effects. I’ve never experienced any side effects after taking Cialis. The effect of Cialis lasts for more than 30 hours while Viagra works only for a few hours. This looks like a really in-expensive way to make some holiday gifts for the family gift exchange. I’m going to need a lot of Mason Jars. Any ideas on where I can buy them bulk?